Ignition Casino is the latest addition to our list of top Australian online casinos for you to play at. Previously the casino was positioned for players from the US, but in 2016, opened their doors to Australian gamblers. As a multi-platform casino, Ignition Casino caters to a wide variety of gamblers, from beginner to the high roller. The casino is available in instant play; in other words, you can rev up your online gambling experience instantly without unnecessary downloads. Looking for an adrenaline-pumping casino? Ignition Casino is the casino to play at. Check out our detailed review below. Creating an account for real money on Ignition Casino couldn’t get much easier. There is a “Join” button on the top right-hand corner of the homepage, and then you will be asked to enter your personal information. Your name, birthday and email are required, along with a phone number and postal code. You will also have to create a password for your account, as well as a security code that you will need to verify your identity when making a withdrawal. Finally, you will be asked about your deposit methods and which bonuses you would like to redeem, which you can find out more below. So, how do you fund your real money bank account at Ignition Casino? It’s simple and safe. The casino offers a range of Aussie-friendly banking options for you to choose from. These options are safe, reliable and within the standard withdrawal times. You can make a deposit using a Visa, MasterCard or American Express credit card. You can also choose to use Bitcoin, for which there is a specific bonus! If you are not familiar with Bitcoin, Ignition Casino has a help page that will walk you through the steps of getting Bitcoin. Bitcoin is becoming increasingly popular in the online casino community for funding accounts and receiving money (which usually happens immediately), and Ignition Casino is ahead of the game. To make a withdrawal, you can use Bitcoin and check via courier. Please keep in mind that your choice of banking will ultimately determine your withdrawal time. To lure new gamblers, a casino will usually offer a lucrative welcome bonus that kicks off your gaming experience. Boost your bankroll with a AU$2,000 welcome bonus when you join and continue to do so by taking advantage of the casino’s other bonuses and promotions. This is split up into a 100% up to $1,000 Casino bonus, and a 100% up to $1,000 Poker bonus. The Casino bonus is subject to a playthrough requirement of 25x. For the Poker bonus, you will be required to download the poker software to collect your bonus. Make sure you read all the requirements you are subject to, which are found on the Promotions page. Then, there is the Bitcoin bonus. You can receive a 200% match bonus up to $2,000 when you make your first deposit. All you have to do is use the code, “IGBITCOIN200”, and you can instantly redeem your bonus. Again, make sure you read all the requirements that are asked of you. We also recommend you check the Promotions page regularly to avoid missing out on the latest offering, because Ignition Casino always has something to offer their players. When you become a regular gambler at Ignition Casino, you will be able to participate in their rewards program. The play rewards allow you to win Ignition Miles every time you gamble; these miles can be cashed in or exchanged at any time! The more you play – the more you earn. 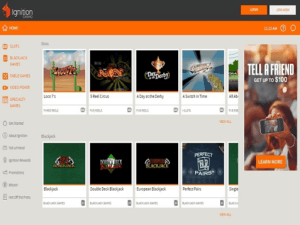 As mentioned earlier, Ignition is a multi-platform casino. This means that the casino runs games from several software providers. 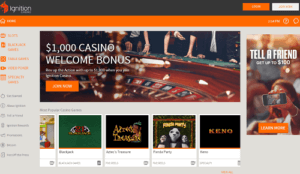 These providers include Rival, IGT, and Realtime Gaming, and you can expect to find the full suite of casino games from all providers at Ignition. This includes a massive collection of classic table games like blackjack, baccarat, roulette, video poker and a ton of specialty games like bingo and scratch cards. Not to mention, there are all sorts of variations of these games. In addition to the impressive casino game section, all the games have excellent mobile compatibility and are available in free play or demo mode. There is also a Live Dealer option at Ignition Casino, where you can play at blackjack, roulette, baccarat and Super 6 with actual live dealers. It brings in some of the atmosphere that you would get at a brick-and-mortar casino, but you can play it from the comfort from your own home or your mobile phone or tablet. There is also an extremely thorough Frequently Asked Questions page, in which you should be able to find an answer to your question. There are also a few articles on Ignition Casino that explains concepts about games. For example. “Understanding Paytables In Video Poker” and “Cash Games Vs. Tournament Poker: How Are They Different?” are just two of the articles you will find there. As an Ignition gambler, your safety and security are guaranteed with high-level SSL encryption technology. This type of technology is standard in the online casino industry, and Ignition Casino knows how important it is to keep your information safe. Furthermore, the games undergo regular testing for fairness to ensure that the casino doesn’t unfairly benefit from your real money wagers. All casino games make use of Random Number Generator (RNG). Furthermore, the casino is audited by leading industry regulatory bodies. Ignition Casino is a fantastic online gaming site for Australians. Our review team found that the casino provides a safe, but entertaining and rewarding gambling experience. Therefore, we rate this online casino four out of five stars. Sign up to Ignition Casino and claim your welcome bonus of AU$ 2,000 today!